Strong and versatile to handle all your material handling needs. Durable welded wire construction with open design permits sprinkler, air and light penetration and reduces dust build-up. Shelves easily adjust in 1" increments. Two large chrome handles. Easy to assemble in just minutes without tools. Includes 4" rubber swivel casters with protective donut bumpers. Maximum weight capacity is 600 to 800 lbs., evenly distributed. Chrome-plated finish. Features a removable 1.5" thick bamboo top which can be used as a cutting board. Underneath the bamboo top is a wire shelf along with a bottom wire shelf and a middle wire basket shelf. Shelves can be adjusted in 1" increments. Includes a side bar with four fixed hooks for handing towels, utensils and other items. Convenient push handle for easy steering. Four 3" swivel casters, 2 locking. 175 lb. unit capacity. Easy to assemble. Chrome finish. 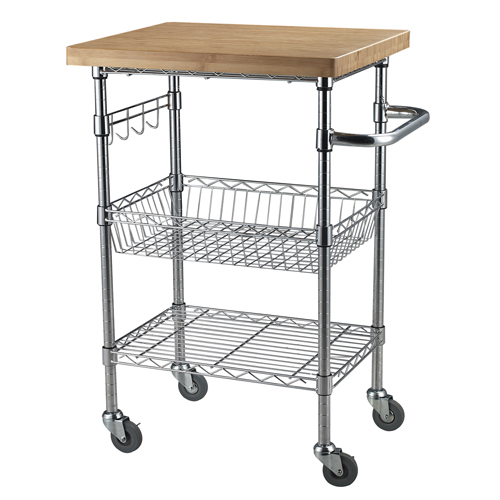 This all purpose cart is perfect to use as a serving cart. Features a 6 wine bottle rack, wire basket shelf and a bottom wire shelf. 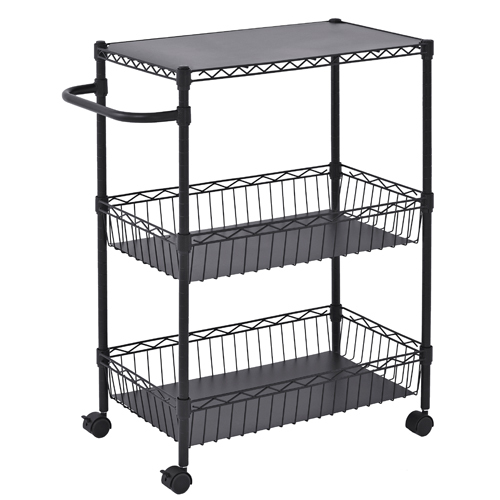 The top level features a durable rubber wood shelf. All shelves can be adjusted in 1" increments to accommodate many size items. Push handle for easy control when moving. Swivel casters, two with locking brakes. Easy to assembles without tools. Durable chrome-plated finish. 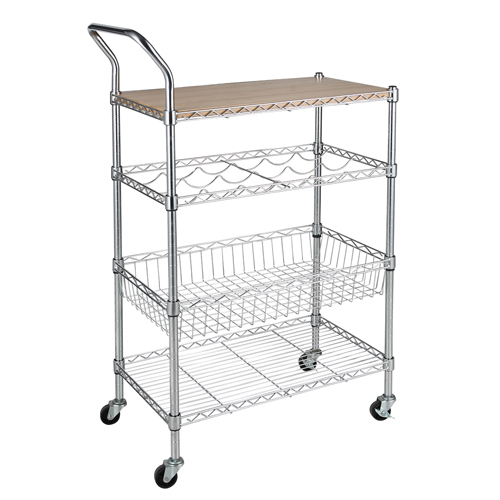 This all purpose cart features a top flat wire shelf and two wire basket shelves perfect for keeping items secure without rolling off. Shelves can be adjusted in 1" increments to accommodate different size items. Push handle for easy control when in transport. Four swivel casters. 2 with brakes. Easy to assemble without tools. Durable black powder coat finish. 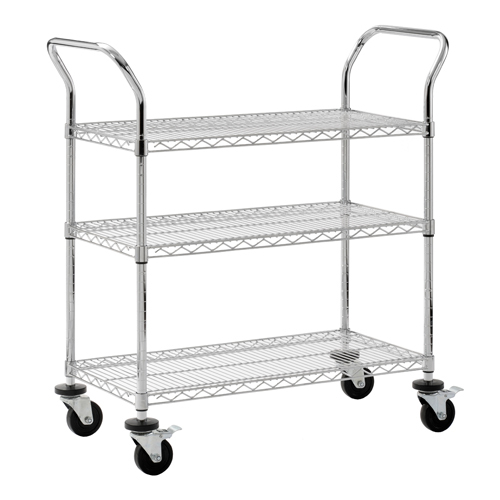 To compare several categories within Carts, Stands & Wagons, click on View All Carts, Stands & Wagons.